ww2dbaseFilipp Ivanovich Golikov was born in the village of Borisov in Perm, Russia to peasant Ivan Golikov and nurse Vassa V. He attended some schooling in Borisov in 1911, and then in the nearby city of Kamyshlov until 1918. In May 1918, he joined the Red Army and subsequently participated in the Russian Civil War. During the inter-war years, he held many political roles in the Soviet military, serving in various locations in the Soviet Union including the Volga-Urals Military District and the West Siberian Military District. Between 1929 and 1931, he attended military college. In Nov 1931, he was made the commanding officer of the 95th Infantry Regiment of the 32nd Infantry Division. In Oct 1933, he became the commander of the 61st Infantry Division in the Volga Military District. In Sep 1936, he was named the commanding officer of the 8th Independent Mechanized Brigade. In Jul 1937, he became a corps-level commander as he took over the VII Mechanized Corps of the Kiev Military District. In Jan 1938, he was made a member of the Military Council of the Byelorussian Military District. Also during 1938, he was made a member of the Supreme Soviet of the Soviet Union; he would be a member of this organization until 1946. In Nov 1938, he was made the commanding officer of Vinnitsa Army, which was reorganized into the Soviet 6th Army in Sep 1939, still under his command. ww2dbaseIn mid-Sep 1939, Golikov led the Soviet 6th Army during the invasion of Poland. In Jul 1940, he was transferred to the General Staff as the Chief of the Soviet Main Intelligence Directorate (GRU), where he would shoulder part of the blame for not being able to detect the German build-up for the German invasion of the Soviet Union in 1941. Relieved of his position in military intelligence, he was assigned to the United Kingdom and the United States as the chief of a military mission. In Oct 1941, he returned to the Soviet Union and was appointed the commanding officer of the 10th Army, in which role he would play a part in the defense of Moscow, Russia in the winter of 1941 to 1942. In Feb 1942, he was placed at the helm of the 4th Shock Army. In Apr 1942, he was made the commander of the Bryansk Front, and in Jul 1942, he was transferred to lead the Voronezh Front. After seeing defeats in the Voronezh-Voroshilovgrad area, he was once again transferred, in Aug 1942, to the 1st Guards Army in the Stalingrad area, where he would also assume the role of the deputy commander of the Stalingrad Front. In Oct 1942, he was appointed the commanding officer of the Northwestern Front for a few days, recalled to Moscow to head the Soviet Main Intelligence Directorate, and then once again transferred to the field as the commander of the Voronezh Front. In Jan and Feb 1943, his troops successfully defeated a number of Hungarian formations, but during the Third Battle of Kharkov, his front suffered heavy casualties, leading to his recall to Moscow. He was made the Deputy People's Commissar of Defense for Personnel in Apr 1943, a position he would hold until 1950.
ww2dbaseBetween Oct 1944 and 1946, Golikov served as an official with plenipotentiary powers charged with repatriation of Soviet prisoners of war. In 1950, he returned the field command again, this time at the helm of the Independent Mechanized Army. In 1956, he was transferred to head up the Military Academy of Armored Forces of the Soviet Army. 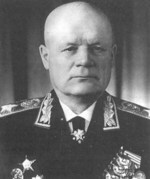 Between Jan 1958 and 1962, he was the head of the Main Political Directorate of the Soviet military. In May 1961, he was made a Marshal of the Soviet Union. In 1961, he was made a member of the Communist Party's Central Committee; he would remain in this position until 1966. He retired from service in 1962 for health reasons and was given an inspector general position which he would hold until he passed away in 1980. He was buried at Novodevichy Cemetery in Moscow. 29 Jul 1900 Filipp Golikov was born in Perm, Russia; his birth date also appeared as 16 Jul 1900 when presented in the Old Style. 20 Feb 1933 Filipp Golikov was awarded the Order of the Red Banner for the first time. 26 Nov 1935 Filipp Golikov was promoted to the rank of brigade commander. 16 Aug 1936 Filipp Golikov was awarded the Order of the Red Star for the first time. 31 Dec 1937 Filipp Golikov was promoted to the rank of corps commander. 8 Jan 1938 Filipp Golikov was promtoed to the rank of lieutenant general. 22 Feb 1941 Filipp Golikov was awarded the Order of Lenin for the first time. 1 Mar 1942 Filipp Golikov was awarded the Order of the Red Banner for the second time. 19 Jan 1943 Filipp Golikov was promoted to the rank of colonel general. 28 Jan 1943 Filipp Golikov was awarded the Order of Suvorov. 22 Feb 1944 Filipp Golikov was awarded the Order of Kutuzov. 3 Nov 1944 Filipp Golikov was awarded the Order of the Red Banner for the third time. 21 Feb 1945 Filipp Golikov was awarded the Order of Lenin for the second time. 20 Jun 1949 Filipp Golikov was awarded the Order of the Red Banner for the fourth time. 20 Jul 1950 Filipp Golikov was awarded the Order of Lenin for the third time. 8 May 1959 Filipp Golikov was promoted to the rank of general of the army. 15 Jul 1960 Filipp Golikov was awarded the Order of Lenin for the fourth time. 8 May 1961 Filipp Golikov was made a Marshal of the Soviet Union. 22 Feb 1968 Filipp Golikov was awarded the Order of the October Revolution and the Order for Service to the Homeland in the Armed Forces of the Soviet Union, Third Class. 16 Jul 1970 Filipp Golikov was awarded the Order of the Red Star for the second time. 15 Jul 1980 Filipp Golikov was awarded the Order of Red Banner of Labor. 29 Jul 1980 Filipp Golikov passed away in Moscow, Russia.